Australia cruised to the gold medal in style on Sunday, smashing Canada by 40 points. 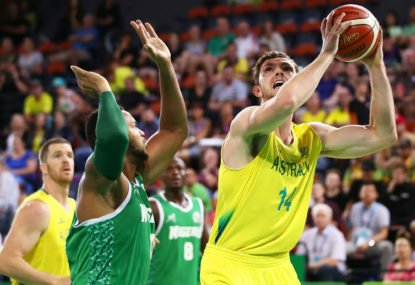 The Australian Boomers will be out to complete a perfect Commonwealth Games when they face shock qualifiers Canada in the gold medal match. Join The Roar for live scores and coverage from 11:30am (AEST). Australia haven’t yet lost a game at the Commonwealth Games, and their most likely challenger – New Zealand – failed to qualify for the final. It was a shock loss in the semi-final, to say the least, with Canada springing a huge surprise on the Tall Blacks, winning right on the buzzer. New Zealand played a poor game, but there is nothing to say they should have been challenged by Canada, who struggled against both the Boomers and Tall Blacks in the group stage of the tournament. Canada had already beaten Nigeria during the group stage, before getting over England in the qualifying final to book their spot against Paul Henare’s men. The Boomers, on the other hand, have been far from perfect, but are yet to lose a game. Australia were challenged by New Zealand in their second group game, with the Kiwis leading for three quarters before squandering it in the final. Their semi-final yesterday saw a thumping 57-point win over Scotland, who, like Canada not making it to the final, weren’t supposed to make it that far in the tournament. It’s hard to get a true reading on where Australia are at given they have only had one genuinely competitive game, but their backcourt and starting five haven’t dominated the way they would be expected to at times. The third quarter against Scotland yesterday was their best of the tournament, and if they can build on that, the North American outfit won’t get close. Despite that, Canada will be full of confidence and given they beat a New Zealand team who outplayed the Aussies for three quarters yesterday, anything is possible. Like in the group stage, the Boomers will dominate from start to finish. Canada may have learnt a thing or two from that match, but their young and inexperienced team will be no match for the Boomers machine. Be sure to join The Roar for live coverage of the match from 11:30am (AEST) and don’t forget to add a comment in the section below.